On the second day of our visits to Irula villages, tour organizer Robert asked me about the experience, both to check in with me but also to get feedback on the tour itself. (It had been a primary goal of Robert and Nancy to get us out to a rural setting and to sit and swap stories in a non-performance platform context). I told Robert that to listen to stories while sitting in the shade of a tree in a rural village in India was, in one sense, exactly why I had come on the trip. That very morning, in fact, as we were being served coconut water (a young coconut with a straw in it) and listening to stories, I nudged the person next to me. "We're listening to stories under a banyan tree. In India. Can you believe it?" After all the hassle of arranging travel, the long trip itself, the jet lag, the crash course in narrative arts of Tamil Nadu (including epic songs, the Mahabharata, bharatanatyam, and kattaikkuttu), sightseeing, living out of a suitcase, language barriers, and the media frenzy leading up to the November 4th election-- after all that, the story swapping in villages was a chance to experience life in the present. A chance to pause... not just to enjoy stories, but to live life in real time. Granted, it's not necessary to travel 9,000 miles away from home to grab a respite from the hustle and bustle of a modern lifestyle. And certainly to make a such a journey for the purposes of experiencing storytelling was a gamble of expectations. None of us, including the tour organizers, knew how the story swapping would work out. So there we were. After brief tours of the villages, we'd gather in a group. We would sit and listen. Our village hosts graciously served us tea, and snacks. We whiled away the hours listening to stories, and some of our group had the chance to tell stories to the villagers. In contrast to the epic stories of the Hindu religion we'd experienced in Chennai and the kattaikkuttu school, here we heard animal fables and local sacred stories, mostly from the women. One notable exception was when the village headman condensed a four hour sacred story into a 45 minute telling for us... despite the editing, he still found the story so powerful that he went into a trance state at the emotional peak of the story (We followed the lead of his wife and just waited patiently for him to return to us). 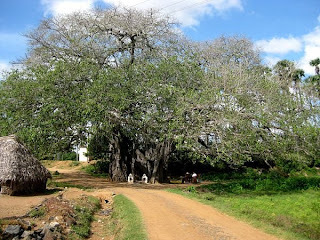 In the village with the banyan tree, locals sheepishly admitted they didn't know any traditional stories. Oakland storyteller Liz Nichols then asked them, through a translator, if they might share any stories about their grandparents. We quickly got two fascinating local legends about relatives who could go into trance states: one story about a woman who could predict epidemics in this way, and another about a man who could summon tigers. We didn't speak their language, we could barely fathom their way of life. We got only a quick overview of their recent history: The Irula are a tribal community with thousands of years of indigenous knowledge of the forest, but the villages we visited were government resettlement projects. In recent decades, forest conservation laws made extraction of forest resources illegal, and apart from a few worthy efforts of non-governmental organizations to develop traditional knowledge into economic engines (snake venom extraction labs, herbal plant nurseries), most of the Irula are agricultural day laborers. Some of the women told us that they never took visited the nearest town (just a few kilometers away), because they could not read the numbers on the buses or the signs in the shops. If they braved the journey, they required their school-educated children to guide them. But we sat down with them and listened. Sometimes life in real time doesn't provide the ideal venue for swapping stories. Real life can mean heat, humidity, dust, mud, goat droppings, snakes (the Irula are known as snake-catchers, and several men were happy to show off their recent finds), cell phones (in rural communities, it's easier to leapfrog landlines), children coming home from school. I recently played back video from one swapping session and what you can hear most clearly is the bleating of the village goats and clucking of chickens. Some of the younger children wanted to touch us white folks, or engage in various versions of peek-a-boo. During one swap, a group of boys realized the grown ups were otherwise engaged and began throwing rocks at each other just outside the storytelling circle. In another, the village alcoholic, attentive to the stories, felt compelled to make the session an interactive one. His outbursts were deftly and good-naturedly handled by our translator. Sitting under the trees in rural India was picturesque, but it's also far from luxurious. Some of our group had health issues, which meant sitting cross-legged on a straw mat on the ground for two hours was far from ideal (chairs had to be hauled in from homes and schoolrooms). But despite the challenges... of culture, of language, of lifestyle, of venue... such an experience really drove home the essential elements of what it means to be a human being. Because despite all the differences, were able to find common ground simply by being willing to listen to and share stories. After our trip to the Kattaikkuttu school, we headed out to the countryside. We joked about going to the jungle (and if any lingering tensions within the group might turn into a Lord of the Flies moment), but it turned out to be mostly scrub forest (and thus the accidental geography of vegetation prevented our small band of travelers from devolving into anarchy). As part of our desire for cultural exchange, and the government's and local NGO's to develop cultural tourism, we visited several Irula villages (the Irula are one of the aboriginal peoples of India who trace their ancestry back before Dravidian migrations) and got to swap stories. 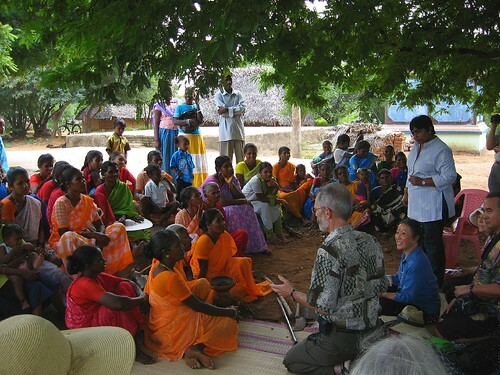 In this photo, San Francisco storyteller Jeff Byers is sharing a story with the women of Chenneri, an Irula village in the Chenglepet district of Tamil Nadu. Storyteller Jeeva Raghunath translated between Tamil and English for us. The story swaps were a highlight of the trip for me, and I'll be posting more thoughts on this portion of the trip soon. Today our tour took us to Kanchipuram, a two hour drive from Chennai, so we could learn about a form of street theatre known as Kattaikuttu, combining dance, song, costume, and spectacle to bring to life episodes of the Mahabharata at a rural school dedicated to the art form. This was quite fun as we got to hear a condensed version of the Mahabharata in English, discover the cultural context in which his theatre form takes place, learned a few dance steps under the tutelage of the master artist P. Rajagopal with help from his teenage students, sing in Tamil, eat a home cooked South Indian meal, and get a chance to watch the students show us various entrances. What we're learning is clearly a theatre form-- but a) we came to India to hear stories, and we have to hear the Mahabharata in Tamil through song and dance, we will, and b) the school founder, Hanne M. de Bruin, is an academic, and knows how to spin the theory of performance so that she can claim (and rightly so) that these forms of storytelling and intimately connected to the rhythm, melody, and drama... take them away and these stories don't work--- and, this is an oral tradition we're experiencing (there's no corps of writing that the work springs from). So... today, storytelling with a harmonium, two drums, a mukavinai (a small oboe-like instrument) and two sets of hand cymbals (talam), wooden swords, choreography, improvisation, and song. We return to the school tomorrow for another half day of workshops. Photos and Youtube links later. This internet cafe suffers from intermittent power cuts so I'm rushing this. Would you travel halfway around the world to learn about another culture's storytelling traditions? I would, and along with 17 other "storytelling tourists," I'm in Tamil Nadu, India, for the next two weeks as part of a collaboration between the World Storytelling Institute in Chennai, India, and Eth=Noh-Tec of San Francisco, California. Times of India article: link. Today's article in The Hindu: link. Being out of the tents and into this modern, well-run facility has brought things to the next level. (The predominance of tents in the American Storytelling Revival is, in my view, a failure of imagination based on the notion of copying wholesale the model of production from the National Storytelling Festival in Jonesborough, Tennessee. (Jim May nearly admitted as much re: the Illinois Storytelling Festival) While Sobol's research rightly points out the accidental serendipity of the Jonesborough tents echoing the liminal space of past cultural events (the circus, chatauqua, and the Methodist revival meeting), tents are a solution to an architectural need: to create a temporary space in the out-of-doors where people can gather for a performance. I think, after 30 years, we can say "So that tent thing, trying to re-create the past-- How's that working out for ya, audience-wise?" For the Mesa Storytelling Festival, it was a no-brainer- they went with what they have: an Arts Center that was already designed to be a cultural magnet, an economic engine, a local landmark, a regional "destination," and a recognizable hub for the arts. If you have a 212,000 square foot facility to host arts events, there's no need to set up tents in a field. The liminal space that storytelling creates can be created anywhere... tents are just one option. It's always refreshing to hear opinions from a pro about the production end of things-- if only because it is so rare (Storytelling is a small community, and not one that likes to air its laundry in public; it prefers to spread the word across kitchen tables and conference calls). Sean is one of the few members of the community that not only has a public platform (or seven) for discussion, but isn't afraid to share his candid opinion. She reviews at least one theatre production a week-- sometimes during the summer, and especially during the Indianapolis Fringe Festival-- a dozen or more! That she is passionate about live theatre is clear. She'd be an asset to have in any audience. But the reason I'm calling her out here is that she is consistently reviewing storytelling performances for adult audiences with the same passion. And lest ye cast aspersions on a theatre critic for sneaking into the storytelling room (The subject of the storytelling community's aversion to live theatre and theatre critics will be left for another post), Hope has storytelling street cred: she's a full time librarian and a part time storyteller. When she does review a storyteller, I note it in the linkroll in the left hand column of this site. Kudos to Storytelling Arts of Indiana to programming storytelling programs for adults in the first place... giving Hope performances to write about. Hope also covers the storytelling of the Indianapolis Theatre Fringe Festival and the Going Deep retreat. As far I as I can tell, Hope Baugh is the only person in North America blogging about live storytelling performance from the perspective of the discerning audience member, and by doing so, educating her readers (many of whom are interested in live performance (theatre) and may not be familiar with storytelling) about the art form. Jaine Treadwell writes a column in the Troy (Alabama) Messenger: "You Have to Experience Jonesborough"
Laurel Winter, "Tell Me a Story --and make it a good one"
Wendy Edey, "Pilgrimage to Jonesborough"
Karen Kennedy, "Once Upon a Time"
One thing I notice about the blog entries on the Festival is how many of them don't focus on the storytelling, but on "making the pilgrimage." Part of it is that some bloggers are simply posting a diary, they're not out to review a performance. But part of this phenomenon is the mystique and lore surrounding the festival (a culture that is both organic to the event and a carefully cultivated (as documented by Sobol and Gneiting), which, for some people, makes writing about the experience moot. Case in point, over the past weekend, I caught up with a friend who reminded me of his own pilgrimage to Jonesborough in 1993, and --beaming the whole while as he recounted it-- he can still remember what stories he heard from Jim May, and Ray Hicks, and Jackie Torrance, and how much his family loved making the trip, and how profoundly he felt "the presence of truth" in the storytelling, a clarity he hadn't felt since his combat days in Vietnam, albeit this time without the horror. His enthusiasm was so unbridled as so refreshingly uncynical that he nearly sold me on packing up my own kids and jetting across the country for next year's festival. ...but I gotta think this is part of her standard repertoire. Oral Tradition Journal Opens Its Doors: It's All Available, Free, Online. Since 1986, The Center for Studies in the Oral Tradition at the University of Missouri has been an interdisciplinary center for research on oral traditions. Its flagship journal, Oral Tradition, has been a treasure trove of papers in anthropology, archaelogy, linguistic, religious studies, performance studies, literature, folklore, and various languages. It has just opened up its archives (dubbed eOT) via the Web for everyone to access (Previously, you had to have a subscription, or hope your local university library subscribed or could grant you electronic access to the issues since 2003). Every article it has every published, available, now, online, for free. With the advent of eOT, the free, open-access electronic version of the journal based here, we aspire to remove many of the natural barriers created by print-based and subscription media. Since we believe that academic contributions should be as democratically available as possible, we are from this point onward offering the journal as a pro bono, gratis contribution to the field. Anyone with a connection to the internet will be able to read and redistribute its contents – not only the current issue, but also the entire 22 years and 10,000 pages of back issues. In addition to reaching a much larger and more diverse readership, we hope that eOT will encourage submissions from scholars whose voices are not customarily heard in western print media because of the difficulties involved with currency exchange and distribution networks. The archives are searchable by keyword, there's a master index, and all articles are available as PDF files. Even if you're not an academic, the site is a fascinating treasure trove of papers on a variety of subjects: from Homer to Beowulf, from Coyote stories to The Canterbury Tales, from Japanese theatre to French covers of Bob Dylan songs to the epics of India. Do a little digging and find a story to tell. And if there are any academic journals out there focused on other specific aspects of oral tradition, ahem, might I suggest (again) considering open access as a publishing model? Learn more about Open Access at Wikipedia or at the Public Library of Science. Ellouise Schoettler blogs all four days of her trip! You go girl! Found a few more mentions via Google and Myspace, but just namechecks of the festival under "what I did this weekend" and no reports. Hey, an actual entry from one of the performers, Minton Sparks, on Myspace. Jeff Brunson: "The Providential Buckeye"
Betty checks in post-Festival from Jonesborough at her blog. First weekend in October, it must be storytelling time in East Tennessee. The National Storytelling Festival, in Jonesborough, Tennessee, now in its 36th year, has, since its inception cultivated a mystique and body of lore around itself. It's doubtful that anyone in Jonesborough will be blogging the National Storytelling Festival live. However, there are a number of people reporting in via Twitter... the "microblogging" service that lets you post VERY short blog entries from your mobile phone. I don't know any of these people, but they are publicly posting these updates. On the web page, you'll see three columns, each with the header "monitter" (or you might see "apple" "iphone" "mac"). Cheers to Nora Dooley, Doria Hughes, and all those Massachusetts tellers involved in massmouth, a new project to produce and promote storytelling events in central Massachusetts. Keep up with them at their blog, their Ning site, and their YouTube Channel. My editorial comments: great idea, keep up the good work. Can't wait to see where this leads. I'm away on vacation. While I'm gone, post in the comments any questions, observations from the National Storytelling Conference, or discussions you'd like to start. New posts after August 18. If you attended the National Storytelling Conference held in Gatlinburg, Tennessee this year, feel free to post in the comments any questions, observations, or comments on the various workshops, keynotes, panels, and/or master classes. I'm on vacation. But here's a question for you, to ponder, and comment upon. Eric Wolf hosted a panel discussion this morning at the National Storytelling Conference in Gatlinburg, Tennesee, on the future story of storytelling online, examining the role the internet is playing in shaping the 21st century storytelling movement. This question is for those of you, who, like me, could not be there. If you were attending the discussion what resources would you like to know about? No fair answering if you did attend the panel. Looking for storytellers on YouTube? UPDATE February 13, 2011: YouTube discontinued Groups as of December 1, 2010. The way to find storytellers on YouTube is not via the search box (which, despite an update by Google, still isn't helpful)*, is via The Ancient Art of Storytelling group. For the past two years, this group has been a repository for YouTube videos featuring stories told by amateurs and professionals alike. You can find storytellers like Lethan Candlish, Sean Buvala, Yvonne Healy, Ruth Halpern, Mike Lockett, Joe Hayes, Dale Jarvis, Margaret Read MacDonald, Priscilla Howe, Alton Chung, Michael McCarty, Clare Muireann Murphy, John Row, Kate Dudding, Ellouise Schoettler, Martha Escudero, U. Utah Phillips, Diane Ferlatte, Nancy Donoval, Antonio Rocha, Norah Dooley, Gene Tagaban, Gale Portman, and the Gypsy Moon Tellers to name a few. (The tandem team of April Uhrin and Robin Rundquest, the Gypsy Moon Tellers, were the first performance storytellers to post video of their work on YouTube, beginning in June 2006). The Ancient Art of Storytelling also has video from sessions of The Moth, stories from Toastmasters, kids, and English language learners, as well as campfire tales, Rakugo, Kamishibai, slumber parties, kitchen tables, and living rooms. There are stories told in at least eight languages. BTW, anyone can join the group, anyone can post a video, but it is moderated to keep it focused on storytelling. * The fault is not the technology underlying the search box. Viacom's cable music channel, VH1 has been running a series called "Storytellers" since 1996. There are hundreds of (unauthorized) clips from this show currently on YouTube (lawsuit, anyone? yes!) There is more demand for Viacom's storytellers than "traditional" storytellers on YouTube, so until such time as demand changes (or supply shifts, say, should Viacom's lawsuit result in YouTube removing all Viacom content from its site), searching for "storytellers" is going to be useless. Over at OKLAHOMA TELLERS, Marilyn Hudson calls out "storytelling elitism." She notes that this beast has two faces, one which hires and one which tells. One side is elitist because it sees only one type of storytelling as "true storytelling" (theatrics vs. traditional, for example). Such storytelling must be defined with terms such as "artistic", "meaningful","educational", and "professional". The folksy stylings of a country teller would never be acceptable. The telling for the sheer joy of telling a saucy or funny tale would be frowned on. The less than perfect delivery, style, or presentation of a newbie would never be heard or seen. In her full post, it seems she's directing this at those who hire storytellers. I suspect she has one or two specific producers in mind (but I don't know the Oklahoma scene well enough to say for sure), and I'm assuming she thinking of storytelling event producers. But a producer who doesn't want an untried teller on their stage is no different than a movie theatre booking a Hollywood film over the neighbor kid's low-budget summer film project. To exclude novice storytellers from the stage at performance events where people have paid admission isn't elitist, it's good business sense. Telling stories for the sheer joy of telling stories is great. I'm in favor of that too. It has its place at family gatherings, around campfires, and even, in the context of performance events, at open mics or story swaps. The other side of the face is the storyteller who has come to believe that abstract artistry is superior to heartfelt communication. They have come to believe the rhetoric of the need for lighting, props, makeup, and a "brand". They have allowed storytelling to be defined by large stage theater instead of standing on its own -and very -unique feet. I don't know any storyteller that believes that abstract artistry is superior to heartfelt communication. (Neither do I know any that insist on lighting, props, and makeup... but then, I'm not familiar with the Oklahoma storytelling landscape.) I do know solo performers who are accomplished storytellers who do prefer to tell in theatres, use a script, but they don't call it storytelling. They insist on calling it theatre. Every storyteller has a different style. And each teller may be at a different place along their learning curve (so that, for example, they haven't mastered the use of "meaningless shouting" in their stories... er, or rather, the appropriate use of volume and physical energy). And we all have our preferences. But I don't meet many storytellers who push their style as better than others. But, if Oklahoma is somehow fomenting a cadre of uppity storytellers dedicated to the notion that storytelling should be defined by loud and eye-catching shenanigans performed without regard to the needs of the audience, I'm with you Marilyn, let's send those elitists back to the vaudeville circuit where they belong. Rather than stick my foot in my mouth again with any commentary (snarky or otherwise) regarding a storytelling event two thousand miles away, I'm just going to point to producer Don Hall, who has posted his round-up of his Skald 9 Festival in Chicago over on his blog. Storytellers: Who Speaks for You? Most of the storytellers I know consider themselves performing artists (identifying as one is helpful come tax time). However, most of the same storytellers don't consider themselves as part of the larger cultural ecosystem of performing arts. Partly that's historical: the storytelling revival of the last thirty five years didn't blossom from the performing arts community. If I recall my Sobol correctly, it springboarded off of the traditions carried forward by librarians, folk artists, and the entrepreneurial ambitions of an Eastern Tennessee high school teacher. But every performing artist starts out focused on their art and craft, their technique and their inspiration. Hopefully, as they mature, they realize the need to broaden their perspective to learn where their art form came from-- and its current state in the cultural milieu. All this to say: we performing artists can't wait for someone else to step up to the national conversation on the arts. We're it. Precisely because there are not robust institutions that support storytelling on a national or regional level (key word: robust), it's definitely up to individual artists to step up and join in the national conversation on the arts. In a perfect world, I'd want the administrators, the executive directors, and the university professors who bolster the storytelling community to be leading this charge-- but that's, what, maybe 8 people nationally? The National Performing Arts Convention took place in Denver, Colorado on June 10-14, 2008. "Taking Action Together," NPAC sought to lay the foundation for future cross-disciplinary collaborations, cooperative programs and effective advocacy. Formed by 30 distinct performing arts service organizations demonstrating a new maturity and uniting as one a sector, the convention was dedicated to enriching national life and strengthening performing arts communities across the country. So the theatre service organizations were there. So were the orchestra, dance and opera service organizations. In fact, they held their national conferences concurrently in Denver. The conductors were there, the chamber musicians were there. The music critics. The manager and agents. The university theatres. The composers. The producers. The dramaturgs and literary managers. The teachers. The grantmakers. The folkies. The lobbyists. National Performing Arts Convention Official Site. NPAC did schedule several solo performers who claim the mantle of storyteller, including Mike Daisey and Red Feather Woman. The only mention of storytelling in the Program Book (which you can download from the convention website... (hi-res version is 7.9 MB, it's 122 pages long)... imagine that... a conference that releases an electronic copy of their program book to anyone who wants it, not just attendees) was in Will Power's workshop on hip-hop. The NPAC blog at Artjournal contains a lot of the thinking that went into the planning of the conference, especially as to big picture topics for discussion, as well as reporting on what went on, and what will happen going forward. I'll probably spend some time here to mine some fodder for Breaking the Eggs. Also, lots of links to bloggers covering NPAC, so there's more to explore. * There were nearly 4,000 attendees, so I'm hoping that someone from the o.g. storytelling community went. Anyone? Anyone? SKALD time. Chicago. Go. Now. I've already posted how much I love SKALD, Chicago's premiere storytelling festival, despite never having seen it. It's this week. If you're in the area, go see it. Then report back. Since I'm in California, I'm going to miss the performances. I'd love to hear about it. The closest I have to eyes on the scene is Don Hall, and while he tells it like it is, he is also, in fact, SKALD's producer. Ticket info, directions, etc., here. Congrats to Martha Escudero and her fellow storytellers over in Barcelona. Her YouTube Channel just made the midday news in Barcelona (you can skip ahead to 1:15 in the clip, from Televisió de Catalunya) as a must-see online destination. Since Canal Narradores (that's "Storyteller Channel" in English) came onto YouTube 9 months ago, it has set the standard for quality production for traditional storytelling on YouTube. Even if you don't speak Catalan or Spanish, check out some of the storytelling videos. Not knowing the words, you'll actually learn a lot about gesture, voice, inflection, and pauses... and what works on the small screen. You can also see how quality sound, lighting, and camerawork enhances the performance. And if you're going to be in Barcelona, don't miss Martha's storytelling series for adults, Contes i Cuentos, at the Harlem Jazz Club. But... if the story is working... the magic is there; why in the world would anyone want to stop it? Thus, there is a tragic flaw in organized telling, formal telling. I have come up with a model and many may have heard it before.... Get rid of the main stage. Create independent smaller stages here and there and let tellers tell as long as the magic continues. Now how is that determined.... not hard to tell... I would set an audience minimum.... say 5 people and you keep going four or less and you vacate the stage if another teller is without one. But only if another teller is waiting for a stage. I would also have a stage maximum. Something like 30. More than thirty then audience would have to visit another stage. You regulate this by putting thirty blocks, poker chips in a box at stage door. Audience members take a chip or block or rock whatever and when they leave they put it back. Not too difficult. That way you can have a formal event which preserves a realistic cultural setting and when tellers can tell as long as the magic continues. If you have enough stages-- that can be all day! This would be ideal when one has access to a school and classrooms. Is there any real reason for mass events or arbitrary cut off times? Look at the Turkish epic singers....no cut offs for them! I'm intrigued, both by this model and its analogous kin in the tech sector: the unconference or the Open Space Technology meeting-- professional gatherings designed to be participatory, to maximize knowledge sharing amongst a group (instead of the talking-head-to-audience model where interaction is pushed to the corridors and times outside scheduled sessions), and where you can vote with your feet. Don't like the conversation/panel/session/room you're in? You're expected to leave! 3) folks who grew up deprived of traditional tales (damn television!) and as a consequence can't relate to traditional tales, ergo, by default, prefer personal tales. Are audiences hungering for something they've never had? Or something they once had and lost? Did your family tell stories, either around the dinner table or at gatherings of the extended clan? Does that experience have any impact on how you feel about hearing personal stories at storytelling events? A follow up to my previous post. Normally, I wouldn't rise to the bait of an anonymous poster, but she called me on my snark, and this made me realize something that Sean has commented on before: from my blog postings, the reader can't tell what I actually feel about a subject. So here's an update. Over in Chicago, Serendipity Theatre Company's got a good thing going with 2nd story, a monthly series and annual festival featuring personal storytelling at a popular wine bar. It sells out. It gets good press. It develops writers' performance skills and actors' writing skills. It celebrates the art of the well-told story. And storytelling plus wine? That's a damn good idea. I wish more o.g. storytelling events featured wine. Would that any venue I tell stories in is featured in a Zagat guide. Jealous much? Yes, I am. Because the old school storytelling community has missed the boat on this one. Dropped the ball. I looked at the roster of 2nd Story's storytellers. I looked at the behind-the-scenes organizers. I looked at the sponsors. Don't see any of the old guard. I can see storytellers skipping over WNEP's Skald (it's off-Loop, it's fringe, it's under-the-radar). I don't see how they could have missed this one. In my previous post, my use of the word "cringeworthy" wasn't a swipe at Ms. Stielstra, for her definition of storytelling. It was a swipe at the Chicago Storytelling Guild, who are either invisible or irrelevant in the Chicago arts community. My remarks on the wine tasting at 2nd Story wasn't meant to be a swipe at the event. I just don't understand (not being an experienced wine taster or frequenter of wine bars myself) how the wine tasting and the storytelling go together. An organized wine tasting seems to me much more formal and stuffy than the communal, relaxed vibe that the storytelling can bring out. But I haven't been there. It works for 2nd Story. 2. The Revival of Storytelling will continue without them. The theatre and literary community, in recognizing the power of the personal story, are celebrating the art of storytelling. Hell, the business community, from "knowledge management" experts to marketing and branding gurus are carrying the storytelling torch, too (to my chagrin). So, I apologize for not being clear. And reading a story out loud off of a piece of paper is storyreading, not storytelling, and isn't a performance art. And putting it on YouTube doesn't make it a better experience. "12 days. 54 stories. 46 storytellers. And 5000 glasses of wine." Now that's a storytelling festival I'd like to see! I wouldn't call a wine bar the ideal venue for storytelling, but-- according to the bar's website, surveys like Zagat's give it a rating as a top night spot right up there with the Green Mill (one of Al Capone's former speakeasys and home of the infamous poetry slam). In that company, I wouldn't mind having that venue on my resume. Oh, it's personal storytelling. Nevermind. CLTV Reporter asks: "Is there a storytelling scene in Chicago?" Festival director: "There's a really active theatre scene, and there's a really active literary scene, and what we try to do is-- kind of-- meet in between." Okay, granted, this is an entertainment reporter, not Woodward & Bernstein, but the fact that this answer got a pass is telling: it means that there is no Chicago storytelling scene. Although the video interview emphasized the performance, browsing through the other video clips on their site and on MySpace, I found the festival gives a pass to the writers... there's a lot of "storyreading" going on too. Maybe after the third glass of pinot you don't mind that the evening's entertainment is engrossed in a piece of paper held in her hand and is reading AT YOU. or this TimeOut Chicago article. This feature at CenterStage got me laughing. As if a wine bar wasn't a difficult enough venue, the festival takes a break between each teller to have everyone taste another wine. I guess you have to be there. Just the image, though, of the juxtaposition of the seriousness of which you're presenting flights of wine with the literal spotlight on the personal storyteller is giving me a spot of cognitive dissonance. Still, I'd love to see this once. Anyone seen it? 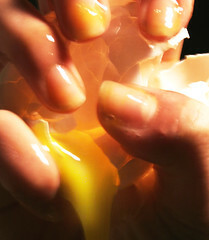 ...each of those three words -- ''professional,'' ''arts,'' and ''organization'' -- is in radical flux at the moment. That suggests that a phrase (and an assumption) combining all three could mean less and less in shorthand form. And while the National Storytelling Network is not a "professional arts organization," at this particular junction in its life cycle, the leadership and members would do well to consider Taylor's initial thoughts on the relevancy (or, the increasing irrelevancy) on the traditional roles of an organization. Link to Clay Shirky, describing the concepts in his new book, Here Comes Everybody: The Power of Organizing Without Organizations, in a 42 minute lecture at Harvard's Berkman Center for Internet & Society. (Also available on YouTube). Well shut my mouth and call me clammy. The National Storytelling Network, a membership-based organization dedicated to the promotion of storytelling (primarily oral storytelling), has been in poor fiscal health for some time. The Board finally made some necessary hard decisions and thus the organization now finds itself with no Executive Director and no current plans to get one (until such time as it can afford one). I've had some issues with the organization, mainly regarding communication. So to my astonishment, the Board (which is necessarily taking a more active role, since staffing levels have dropped) have set up their own Web site (using Google sites) for the express purpose of communicating with the membership. (Although NSN has its own web site, I'm guessing that both the site design and its content management system are the wrong tools for this purpose). Furthermore, the site is interconnected with a Discussion forum, courtesy of Google groups. This is the first time in my nine years as a member that the Board has taken such proactive steps to communicate with the organization membership on the state of the organization and what the Board is doing... and to invite participation in a discussion in a public forum. (Okay, I'm biased. I recall that the Board usually wrote some 400 word piece in the magazine every once in a while, about... something. They surveyed the membership once or twice. And they talk at the annual conference). Whatever the outcome of this experiment in communication (and it will be an experiment: most of the NSN membership shy away from using web tools for communication), I am very glad that the leadership made the move towards public transparency, and open communication, and using the Web to make it happen. How very twenty first century. (Now if only my state liaison might do the same). WNEP Theater has announced its annual auditions for SKALD, their annual Storytelling Festival. 2. Unlike most storytelling festivals in the United States, this one has an open audition process. 3. "Rooted in the oral traditions of nearly every organized society, storytelling is theater stripped of all its ‘dazzle camouflage’ and focuses strictly on the qualities of story and teller." 4. In an homage to traditional storytellers of old, they have a competition of improvised storytelling. 6. They get kids to tell stories. In or near Chicago? Drop a line to Don to schedule an audition. DCist covers a lecture by Ira Glass, host of National Public Radio's This American Life. Glass tells his audience, as he has many times before, that storytelling is what radio does best, and that it’s hardly ever used for that purpose. Which I find ironic now that This American Life is starting its SECOND season as a television show. (Storytelling may not be what television does best, but it's almost always used for that purpose). And coming up May 1 a live version of TAL will be broadcast via a digital satellite video feed (everywhere except the West Coast). Only this live event will show clips from the upcoming TV season. Wait. What? Fans will go to movie theatres to watch a live feed of a radio host showing clips from a TV show? WTF? DCist article: "Empathy is What Makes Us Sane." With all my complaints about personal memoir dominating the storytelling scene, you'd think I'd be down on TAL. Funnily enough, while I do have complaints about the show, it's not their choice of genre. It's their style and tone I that mars the compelling storytelling (i.e. their need to explain the moral of every story and their overreliance on the personal memoirs of their own production team (Blumberg, Glass, Hitt, Goldstein, Updike, Vowell, etc. --all very talented writers and editors, but frankly, when it comes to determining how interesting their own lives are, they're not by any means impartial). Snarky but dead-on coverage by The Onion, from a year ago: "This American Life Completes Documentation Of Liberal, Upper-Middle-Class Existence"
Kevin Kelly revisits his "1000 True Fans" hypothesis, in which he suggests that microniche artists could make a living from a limited fan base. In reality the life of a "microcelebrity" resembles more the fate of Sisyphus, whose boulder rolls back down the mountain every time he reaches the summit. After every tour I feel exhausted but empowered by the thought that a few people really care a lot about this music. Yet, a few months later all is quiet again and CD/downoad sales slow down again. If I take the time to concentrate for a year on what I hope to be a breakthrough album, that time of silence widens out into a gaping hole and interest seems to fade. When I finally do release something that I feel to be a bold new direction, I manage only to sell it to the same 1,000 True Fans. 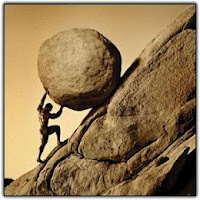 The boulder sits back at the bottom of the mountain and it's time to start rolling it up again. Hat tip to Sean for this one. A number of years ago (over 15 most likely) I read an article on storytelling in the USA (I was in the UK back then) and the growing - then- desire to hear personal stories and how the British writer was disapponinted in not hearing any traditional tales. I never understood the popularity of personal stories. Why would I want to hear about some stranger and their life? What is the point? I do not care about them; I do not know about them - I want to hear good 'old fashioned' stories. Three years ago a friend of mine let me borrow a Donald Davis CD recording - "The Crack of Dawn". I had it for a long time before I listened to it and my friend kept asking if I had listened to it, and what did I think. This coincided with hearing Jo Radner tell a brilliant story that made me sit up and think. It was not a tradition tale at all. I am not really sure why I was there. But something went off inside me, so when I got home I sat down and listened to the Donald Davis CD. I was amazed. Bowled over. Enthralled. I ordered a bunch of his stuff for the library. A couple of years ago I heard Elizabeth Ellis and was knocked out, reduced to tears. I heard Jay telling his "Pill Hill" stories and was inspired by his telling and by the tales he told. I heard Meg Gilman last year at STF and loved her personal story, for it's strength and passion. society we live in, or have lived in. Maybe, in some way, we can look at these personal stories as, in a certain light, contemporary folktales. These stories that are being recorded are capturing the now. In a few hundred years time, who is to say that these tales will still be being told, but not as personal stories, but as folktales. Me, myself, I enjoy, once in while, hearing a really good personal tale. I find them - sometimes - enlightening, teaching me something about myself in much the same way some folk and faerie stories do. But I personally love to tell the 'tradition' folk and faerie tales. I do not think I have the talent - right now - to tell a personal tale. Maybe the second wave in the rise in popularity in hearing personal tales comes from a growing interest in storytelling and this new audience is finding it easier to relate to personal stories - they can see something of themselves in these tales which they cannot (I blame tv for everything) in the 'tradition' stories. I would love to see a balance at festivals of both. Not for me, I would prefer the majority to be traditional tales, but maybe if people 'learn to listen and grow' through personal stories, they will find the magic and power of the older stories. I have noticed that The Moth style events (story slams etc.) are pretty much entirely personal stories and primarily a younger crowd than a typical storytelling event. I think this stems from what others have said about how people feel disconnected, don't have the same opportunity to tell their own and hear other's stories as in the past. We are also all coming from much more diverse backgrounds with different experiences than ever before. I think in this regard that personal stories serve two purposes. Hearing the stories of someone from a similar time, place or culture as you helps to reinforce your personal identity. Hearing the stories of someone from a different time, place or culture is new, exotic and hopefully helps you to begin identifying with them. Perhaps the appeal of The Moth's aesthetic (ten minute true stories from the teller's personal life (although recent squabbling in the blogging community over the veracity of Malcolm Gladwell's "true" story at The Moth seems to indicate that they don't let the "true" part get in the way of a good story) is this: the simple elevation of the well-done kitchen table story with a microphone and a spotlight (in a venue with a well-stocked bar) celebrates America's obsession with the cult of the individual. And again, if you've got an underused storytelling muscle in your frontal lobe, it's easier to visualize a story set in a familiar milieu, be it New York in the 1990s or Middle American in the 1950s. I posted the question as to why personal memoir was so popular to the Storytell Discussion list. Several folks replied, and I asked for and received permission from several of the responders to post their thoughts here. does anyone think the reason could also partly be society's obsession with the previously private side of others? Now I'm sure everyone here is going to deny wanting to know anything about any celebrity, yet something is driving this celebrity/private side obsession. Is it transferring over to storytellers and the audience preferences? No, seriously. Are we more open to stories that approach how another person personally looks at life or life's challenges because we've been inundated with the private lives of many celebrities? Has it made it okay? Do we expect the truth, the whole truth, and nothing but the truth in all its ugliness and glory? After all, fairy tales and literary stories make you reflect in an anonymous way. You don't know the characters personally, because they aren't real, but you learn lessons from their challenges. Now, similar messages within personal stories are perhaps more identifiable because the real live storyteller on the stage is just like you, real with tough challenges. (celebrities are real people living in an unreal setting). Non-fiction books outsell fiction, but they didn't used to. Is this a result of the information society? We just gotta know details? We expect to know, so tell tell tell? My feeling, at least with the popularity of personal stories in the U. S., is that our youth over quite a number of decades is no longer exposed to fairy tales. Maybe the Britney Spears' and Paris Hiltons of our pop-culture are so characterized that they are the fairytale stories now. And somehow it's transfered over to how we all tell stories. Interesting to compare the rise and fall of teen pop stars with the fortunes and misfortunes of princesses and youngest sons... but I don't think an obsession with celebrity is pushing the hunger for memoir. I think you're closer to the mark, Gregory, with the ability to identify with the protagonists. Adults, particularly, may more easily relate to a personal story than an anonymous folktale character. Perhaps the audience member has reached certain age at which they recognize that they themselves are not as smart as you thought they were and so maybe just maybe this guy onstage knows something (or is sharing that the story of that self-same epiphany). the audience member has an atrophied imagination, and path of least resistance is to follow the story that requires only the image of the very storyteller in front of you and the carefully described landmarks familiar from nostalgia. My point is: storytelling is bigger than "roots storytelling" represented by the festival circuit, and its bigger than "personal storytelling" represented by the Moth. And you certainly can segment your audience and produce events that showcase one sliver of storytelling.... nothing wrong with that. What doesn't make sense is trying to claim an umbrella term as your own. Imagine if Milton Berle had tried to claim "television" as the genre for the Texaco Star Theater show, and got all the other comedian hosted variety shows to claim "well, what we do is television." Those soap operas, those news shows, they're not "television." Imagine if track and field competitors tried to claim that basketball players weren't "athletes" because they used a ball, and had to use teammates. I'd like to see an event producer create a series or even a festival that is truly open to all forms of storytelling. You can read my entire post and discussion here. When Sean mentioned in his Roadblock #10 post that storytellers might be wary of violating the copyright of another author or storyteller, I was dubious. Sure, I get the common sense logic. You can't be accused of violating another person's copyright if you're telling your own story. Apparently this is an ongoing issue of concern in the storytelling movement, but it raised its head in the 1980s at national conferences. But seriously, folks. Were storytellers accusing each other of "stealing" each other's repertoires? Were storytellers "stealing" folktales from other tellers? From my own anecdotal evidence, I can see it might have happened. I learn stories better if I hear them, instead of find them in a book. Visualizing a story from a book is easy, but visualizing the story from book to stage is an added step, which requires more effort. Path of least resistance: tell the story you heard from someone else. If everyone started telling the same Jack tale, or the same ghost story, sure, that's going to turn audiences off. But in the analogous realm of traditional music, it's not at all uncommon to hear three or more different versions of "Sally Goodin," "Muleskinner Blues," and "Cripple Creek" in one weekend, both on the mainstages and around the campfires. That's the whole point of tradition. To carry it on. Sure, there are original bluegrass tunes being made all the time and post-punk old-timey revival re-imaginings of standards, but if you go a whole weekend without hearing a Bill Monroe arrangement of a tune, it's not a bluegrass festival. So... back to storytelling. Traditional art form. Material hundreds if not thousands of years old. Material, therefore, in the public domain. Artists are surprised that others are appropriating the same material? Sure, you can call it unethical. Rude. Lazy. But like the story goes, "you knew it was a snake when you picked me up." "Screw you all and the folktales you tell-- I'm switching to stories from my own life." From what I hear, the change in material did not stop unethical performers from appropriating the personal memoirs of others for their own repertoire. I live in a major metropolitan hub filled with theatre festivals in the summer. Several of them just do Shakespeare. Several just do musicals. Do they end up programming the same shows, opposite each other? Hey, it happens. Two, sometimes three "The Tempest"s in one summer. A handful of "South Pacific"s. They manage. They don't throw the classics out the window and start creating their own new scripts. Copyright isn't the whole answer. Stay tuned for more, on audience preferences, and on an academic's look at the movement. I was explaining to a visiting storyteller one of the secrets to success in improvised storytelling is an accident of the American storytelling scene: the popularity of personal memoir. My improv storytelling ensemble isn't trying to re-create Gilgamesh, or the Canterbury Tales, or an Anansi story. Storytellers Unplugged often relies on the dramatic power of layering multiple stories. A collage of solo monologues. Given a theme, an image, or a single word, and we can riff all night in various voices. So when I say, I don't tell personal stories, what I mean is, I don't tell my own personal stories. I'm not interested in telling them. But when it comes to improvisation: I can make up personal memoirs all night long. So can my other ensemble colleagues. It's just not that difficult. And audiences respond to it. Sean Buvala touches on this point in one of his Roadblocks to Success postings. I don't quite agree with his comparison of storytellers who rely on personal memoir and stand-up comics, because the intent of each type of performer is different, as is the persona/mask they present to their audience... but there's a question that's been bothering me for some time. I know that oral history can be compelling. I'm fascinated by the life stories collected by StoryCorps, some even make my cry. And I totally understand why the Library of Congress wants to save all these stories, as history. But what's going on in the storytelling revival-- that the traditional stories that fueled the movement in the beginning are being pushed aside for more stories about lived experience? Why is the boom in the alternative storytelling movement (e.g. the Moth, Fringe Festival solo performers, --and soon to switch places with the "mainstream" storytelling movement which is driving itself if not to the fringe, then to folksy irrelevance) so focused on personal memoir? Why, as Ben Haggarty of the UK put it --after having been banished to a small classroom at 9:00 AM on a Friday morning in order to present his 2 hour version of Gilgamesh, as the Jonesborough-style festival that had hired him had nothing longer than a 50 minute available during the weekend-- do American storytelling festivals reserve the spotlight on the mainstage for stories that in any other culture are told around the kitchen table? You have theories? Feel free to post in the comments. I bookmarked Andrew Taylor's "mini-manifesto" for the school year back in September. Taylor runs a two-year, multidisciplinary MBA degree in Arts Administration at University of Wisconsin, Madison. At the time, it inspired me that the head of an MBA program wanted to develop cultural leadership that could transform arts organizations with these values. 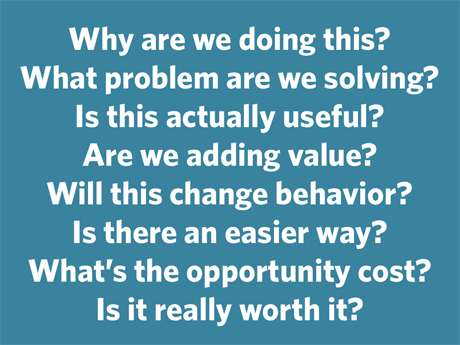 I've been thinking about these questions for my day job... common sense questions, really. Refreshing that they come from a software company (the post was from Jason Fried, the director of 37signals of Basecamp and Backpack fame, a company dedicated to building the best products possible with the least number of features necessary). Not much to add here except to say that I'm going to be doing some reflecting on these questions, and on Taylor's expressed values above, and make an assessment on how well I'm doing. And how well the organizations that support storytelling are doing. Last month in New York, the Toy Industry Association held the 2008 Toy Fair, the trade show where all the toy companies "preview" their new toys for the season (and get an early jump on orders for the 2008 holiday shopping season). Why does this matter to storytellers? 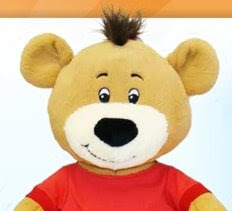 At first glance, it's a teddy bear that sings and tells stories. This is not new. Remember Teddy Ruxpin, the teddy bear with the built-in cassette player? Apparently, he's still being manufactured and still tells stories, although now with digital cartridges. Here's what's new with Smart-e-Bear: he's got a USB port. Which means, the songs and stories are totally customizable. Hook him up to the computer, and with an iTunes-like interface, you can manage and create the educational content, songs, and stories that the bears "knows." Imagine you visit a kid's bedroom. There's her teddy bear. She squeezes the bear paw, and all of a sudden the bear is channeling Bill Harley. Bill Harley's voice is coming out of the bear, telling Bill Harley's stories. Or Donna Washington. Alan Irvine. Diane Ferlatte. Elizabeth Falconer (complete with koto). Oh, by the way... I should disclose that I'M NOT JOKING. Donna and Bill and Diane and Elizabeth and Trout Fishing in America have already licensed their material to be distributed by these talking bears. I think the customization factor is the hook that's generating the buzz... for parents. This is a toy that will be marketed to parents, not kids (no commercials for this toy on the Saturday morning cartoon lineup. I'm guessing that there will be lots of articles instead in Parenting and Women's magazines). And maybe they will buy it. Hip parents who like creating playlists on iTunes will get into the programming of this toy. And practical parents, who aren't by any means frugal (not at this toy's price), but who like to think of themselves as savvy, will appreciate that you can adjust the developmental level of the toy to the age of your child-- extending the life of the purchase. But good marketing to parents and decent sales doesn't mean kids are gonna love it. Don't get me wrong, I'm glad that this will generate more recognition for storytellers. Smart-e-bear. For the 3 to 6 age group, if my kids are any indication, they'd rather hear a Donna Washington or Bill Harley story from a CD on their boombox, or from an iPod. 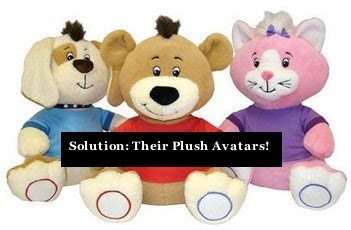 Having it come out of a plush toy is not value added for my kids. Now, if smart-e-bear had a Teletubbies-like screen on their bellies where my kids could watch a video of Donna or Bill telling a story, or failing that, YouTube videos of Star Wars recreated in LEGOs, that'd be value added. Can't afford to fly out the big names to your venue? For just $79.99, you've got his/her avatar, in a cute and cuddly, soft and squishy, family friendly format!! And if you've got a technogeek on your Festival producing team, it would probably not be too hard to hack the smart-e-bear, and voila! You've got Kevin Kling! Elizabeth Ellis! Dan Keding! Don't want to confuse your audience? Buy a smart-e-dog and smart-e-cat and then your audience can differentiate Syd Lieberman from Connie Regan-Blake! Although... I'm not sure if these things actually move. You might have to budget for a puppeteer to animate the toy's arms. Plus, if you can get these things wholesale, or pick up a dozen at CostCo, you could resell them at your festival's souvenir stand for a markup. And if you do happen to have Donna or Alan or Bill at your event, their autograph on this little plush cyborg means even more ROI!